For those of you still wondering whether Publishing 2.0 has suddenly become a gadget blog, I can assure you there is method to this iPhone madness — there is not a publisher or media company who shouldn’t be tracking the iPhone closely. The iPhone is a window into the future of media. If you’re in media, and you haven’t at least played with an iPhone, it’s as mandatory as spending time with this interweb, series of pipes thing. The iPhone interface is truly like nothing you’ve ever seen.- Like using a Mac back in 1984 (which I did — my father bought the first one). 100% touchscreen is the only true multimedia UI, i.e. the only UI that works well (although not always optimally) for text, images, video, web pages, etc. Resizing the screen with the two finger pinch and scrolling with a finger “flick,” as if you were working with a physical object, fundamentally changes the way you interact with a computer screen. Browsing album covers is a deeply nostalgic experience. Visual voicemail just rocks (to skip this message, press…). The 100% touchscreen interface still needs work.- Placing your finger over the content you’re using in order to scroll it can be annoying because, for example, you can’t see what you’re doing, and on web pages, you can accidentally click a link. It would be nice if you could easily activate a small dedicated scroll bar on the side to use if sticking your finger in the middle of what you’re doing doesn’t happen to be optimal. Scrolling zoomed in web pages, especially those that have been sized to make the text fill the screen, often makes the page slip back and forth laterally — there should be a way (maybe there is) to lock the web page laterally and just scroll vertically. The keyboard still needs work.- I trust Walt Mossberg, who had a breakthrough with the keyboard after five days of frustration — I trust that once you get in a groove, it works well — but when you first try it, it’s a train wreck. Everything I tried to type came out has gibberish. You also have to point your thumbs directly down rather than rest them comfortably against a mechanical keyboard. Rotating the iPhone when using the keyboard for email or notes doesn’t switch to landscape and the bigger keyboard — you’ve got to be kidding! The iPhone isn’t optimized for text-centric use.- This may be heresy, but if you just want to read text articles, it isn’t necessarily an advantage to load the “real” version of a web page rather than the mobile version. When you load a web page with a dense, wide-screen layout, the text is SMALL, and it can be hard to get your bearings. You constantly have to double tap to get the main text to fit to the screen without running annoyingly off the edge. 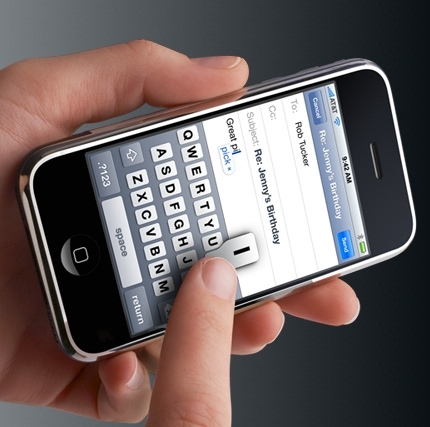 Removing the physical keyboard to provide full-screen viewing was a brilliant move, but it’s also a declaration that text input is less important than image viewing — that doesn’t mean text input doesn’t work once you get the hang of it, but in a mobile device with finite space, everything is a trade-off. Given that 95% of my mobile device use is phone, email, and text viewing on the web, I’m not sorry I went with the Blackberry on Verizon — it’s optimized for text — and you can flick your thumb across the new Blackberry trackball same as your can on the iPhone screen; if I used my mobile device mostly for images, multimedia, and rich web-browsing, I’d be aching for an iPhone. That all said, there is more innovation in this one device than most companies can muster in a lifetime — I’m sure I won’t be able to resist buying a future generation that works out the kinks and is finally on an optimized network.